The oldest cookbook I own is called the Modern Priscilla Cook Book: One Thousand Recipes Tested and Proved at the Priscilla Proving Plant. It was published in 1924, and when I open it, the stale smell of aged paper is immediately apparent. When I say it's the oldest cookbook I own, I should qualify. I have a copy of the Boston Cooking School Cook Book, but it's a reprint of the 1884 volume, whereas the Modern Priscilla is itself actually from 1924. I found it in some used book sale or other, almost for free. The Modern Priscilla was a lifestyle magazine of sorts, with a focus on home, garden and needlepoint, and was published from 1887 to 1930 in Massachusetts, first in Lynn and later in Boston. Evidently, supplementary publications were offered, such as catalogs for gifts and needlework accessories, and a cookbook. It's always such a treat to peek back in time, and listen in on the nutritional/culinary advice offered to the modern housewife at the turn of the century. This recipe is from a section titled "Egg and Cheese Dishes" and comes with a handy introduction called "Facts to Remember When Planning Egg and Cheese Dishes." For your elucidation: "Both eggs and cheese have an important place in the dietary, because they are rich in tissue-building material and contain valuable minerals and vitamins." Well I'm sold. Honestly, though, the idea of baking an egg in a whole tomato is one of those ingenious ways to use fresh, whole foods, so characteristic of the classic, "peasant" cuisines that modernity has seem largely to have forgotten. You find little gems like this occasionally, when the whole becomes so much more than its parts. To most of us, shirred eggs are nothing terribly inventive (although resolutely delicious), and the term simply means an egg baked in a dish with a covering of cream or milk and sometimes topped with breadcrumbs. Obviously in the Priscilla preparation, there's no cream, but you do get the benefit of the bacon drippings being released over the egg as it bakes. 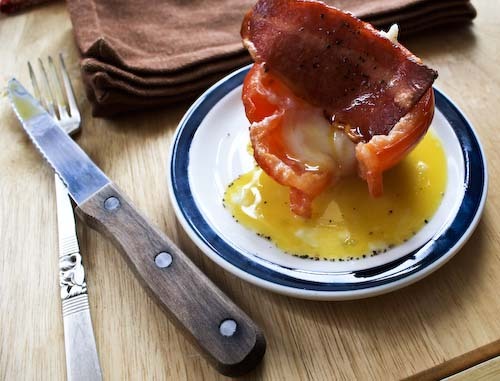 So if you like a runny yolk (and really, is there anything simpler and yet more decadent? 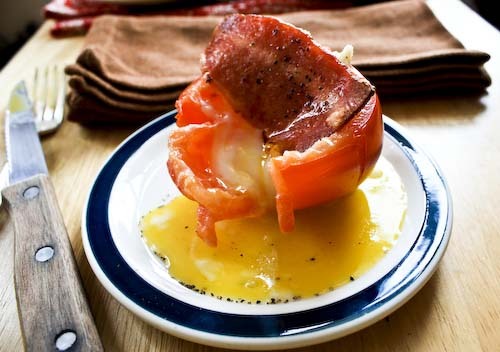 ), roasted tomato and bacon, this is an easy, delicious and unexpected way to serve breakfast. Cut a lid off the top of each tomato and scoop out the core and seeds (I find a grapefruit spoon works well). Brake one egg over each tomato, sprinkle with salt and pepper, cover with a thin layer of bread crumbs, and finally top with a slice of bacon. Bake for 15 minutes, then flip the bacon over, and continue baking for another 15 minutes. After about 1/2 an hour, your egg-whites should have turned opaque and solidified, and the yolk should still be runny (be careful about hotspots in your oven. I made 4 tomatoes, and while 3 were perfect, one ended up more hard boiled). Place the tomatoes under the broiler for about 1 minute (watch them closely!) to allow the bacon to fully crisp. There are so many possibilities with this recipe. You could add a sprinkle of red paprika for the pepper, or top with cheese rather than bacon. I suppose that if you went the cheese route you might broil it for a bit longer and cut down on the oven time. I'd also imagine that little squares of fried polenta would go beautifully with this, to help mop up the runny yolk. Of course, there's always toast, that classic partner of the poached egg. I love old cookbooks. They actually offer a 'fresh' way of cooking that's sometimes forgotten. These eggs look great and I can't think of a better combo. That looks so good! I would have never thought of it, an egg cooked in a tomato? brilliant! 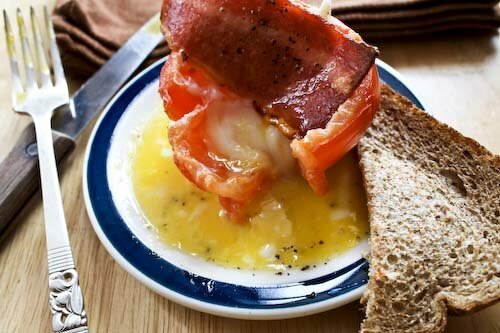 These eggs look so yummy, pitty my hubby hates tomatoes or else i will definately give this recipe a try !!! I believe it is one great way to use up tomatoes and eggs at the same time. I like the idea! It's just so tempting, especially with the oozy egg yolk running out of its basket! This is so totally cool! I only discovered baked eggs about a month ago and can't get enough of them. 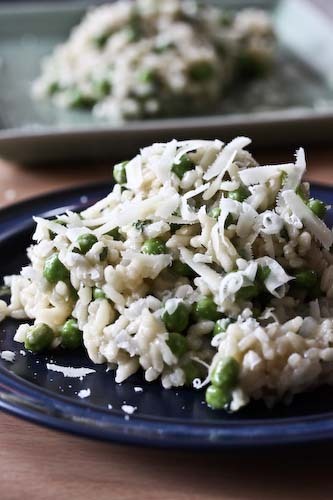 This has some of my favorite foods combined into one tasty dish! What a great idea to cook through your cookbooks. I usually just use a handful as I am always looking for new recipes in magazines, on the web, etc. You have inspired me to go through my books and use them and not just read them. Eggs and tomatoes are a favorite combo of mine - I love this recipe. Wow...these look delicious, I will definitely try them out in the next few days. I love old cookbooks and the window they provide to the people who wrote them and the times they lived in...I constantly turn to two old(ish) cookbooks in particular "Farmhouse Kitchen II" published by Yorkshire Television and "Irish Traditional Food" by Theodora FitzGibbon...they are reliable and very interesting. Here's to eggs in tomatoes! I would love this breakfast! I definitely am going to give this a try. Looks like a perfect Southern Belle breakfast dish. Snooky Doodle, I love to think of them as an english breakfast! How sophisticated for this American! Sharon, I couldn't have said it better myself. It's amazing the things we seem to have forgotten. Old cookbooks are by far my favorite kinds! Arfi, Aubry, Esi and Mimi, it is quite an original idea. I wish I'd thought of it all by myself! Jin Hooi, if I had to count all the times I disregarded what my boyfriend wanted and just made what I wanted...you're a much better woman than I! Eat, I'm not an accomplished enough cook to not follow a recipe, so this is how I'm keeping myself inspired. I'm a bit goal oriented and I like to check things off! I read your comment on AT and came (virtually) running to your delicious blog for the eggs baked in tomatoes recipe. This looks divine. I mean, bacon! tomatoes! and eggs! all at once. My only hang up is that I do not like runny eggs (childhood trauma) and I was wondering if you might have a suggestion on modifying cooking time to ensure the eggs are cooked harder without the bacon turning into cardboard? Hi Anonymous, my suggestion would just be to start the eggs in the tomato and cook them for a bit before adding the bacon. However, I've never baked eggs to a firm yolk, so I really don't know how long it will take. But report back if you figure it out!